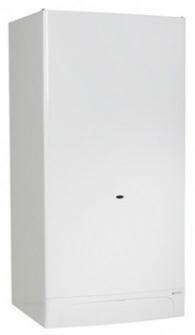 The Riva Plus ERP 24kW System Gas Boiler is a wall mounted model from one of the most affordable ranges by Biasi. This is a highly efficient boiler with a rating of 88% which makes it a B rated appliance. The output rating is 24kW with a 28kW model also available. As a System boiler there is no need for a header tank in the loft as part of your central heating system but you will need a hot water cylinder to for your hot water. Biasi produce the Hydras range of unvented cylinders to store hot water which includes a heating circuit that is designed using external control valves and an internal heat exchanging coil. The Riva Plus comes with simple user friendly controls and a visible pressure gauge so you can make sure that your boiler is operating at optimum levels. This boiler includes frost protection to prevent the boiler from freezing over in those cold winter months. It also has a built in anti-seizure routine which stops the boiler from seizing during those summer months when you may not being using it. This boiler comes with a 2 year warranty.